In his influential book Treasure Islands: Tax Havens and the Men who Stole The World Nicholas Shaxson tells us that if you thought the open face of global capitalism was bad enough, the murky and secret world of tax havens is even worse. If this comes as an introduction to the offshore industry the book lets us know that we should have started worrying, no less been doing something about tax avoidance, for a long time now. 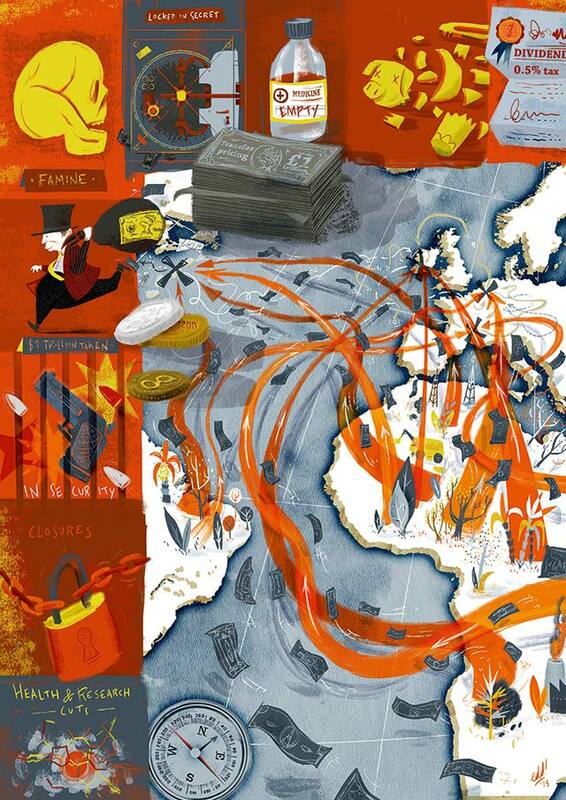 Jonny-Gordon-Farleigh: Your book Treasure Islands: Tax Havens and the Men who Stole the World was first published in 2010 and has since been an extremely important contribution to our understanding of a secret, hidden and misrepresented part of our global economy: tax havens. What has happened since then in terms of the scale and complexity of tax avoidance schemes and how have governments responded? Nicholas Shaxson: That’s a big question. I would say that different things have happened in different countries but what has been a common factor in most has been that public deficits and austerity measures have focused minds on tax revenues. There has been a real change in the public mood and receptiveness to the issue of tax avoidance and that it’s a problem more serious than we thought. In the Go-Go years before the boom, in places such as the UK, the attitude was “I’m alright, Jack,” and people didn’t seem to worry about it. Now, the general public are also realising that tax havens are much more central to the global economy than anyone had previously imagined. They had previously been seen as an exotic sideshow to the main event but, increasingly, the public is realising that tax havens are at the heart of the mainstream global economy. On some measures half of all cross-border trade is conducted on paper through tax havens. Tax havens are not so much about Mafiosi and drug dealers, even though there is plenty of that still about, but most fundamentally about banks and financial intermediaries. That’s the context. Now politicians, if we take the example of the UK, are being led by the public mood. It’s remarkable to see a Conservative prime minister making such statements about tax avoidance, which had previously been considered legal and therefore little wrong with the practice. The shift in public mood means politicians are being forced to condemn tax avoidance and are certainly making the right noises. Also, the OECD — a club of rich countries that had previously jealously protected this awful system of secret information exchange that is very favourable to tax havens and corporate taxation that is very favourable to tax avoiders — now suddenly seem much more open to looking for real alternatives. A closed door is now open, at least a bit. This has not yet translated into any serious policies but there are some incremental changes that have been made such as openings into Swiss bank secrecy, even though there’s still a long way to go there. On the other side of the equation, though, the offshore system has been growing under its own momentum for decades. It is a self-reinforcing process where countries compete with each other to offer the best tax loopholes or secrecy facilities. This race-to-the-bottom dynamic is still firmly in place. So there are two opposing forces: one is the offshore system pushing ahead through its own momentum, and then the public mood pushing in the other direction. I wouldn’t say anything more than that things are beginning to change. A true rollback of offshore abuses needs much more sustained public pressure. JGF: In a recent year-long investigation by Action Aid it found Associated British Foods — whose brands include Twinings Tea and Silver Spoon — have avoided tax and this loss of public revenue leads to less essential social services in Zambia. One of the main arguments in your book is that it is impossible to understand poverty, particularly in Africa, without looking at the offshore system. What is the relationship between tax havens and poverty? NS: The relationship is enormous and some of the best data for Africa comes from Léonce Ndikumana and Jim Boyce of the University of Massachusetts, in their book Africa’s Odious Debts: How Foreign Loans and Capital Flight Bled a Continent. They found that cumulative capital flight for 33 African countries from 1970-2008 stood at $944 billion including interest — close to the $800-ish billion that wealth managers estimate are held by Africa’s wealthiest individuals. But these countries’ combined external debts in 2008 stood at ‘only’ $177 billion. So these countries are not debtors but massive creditors — to the tune of $767 billion, on these numbers. The problem is the assets are owned by a tiny section of the elite in offshore accounts while the debt is shouldered by the ordinary people of Africa. So Africa doesn’t have a debt problem — it has a private offshore wealth problem. This wealth could easily pay off the debt service payments if it was captured by African governments. Let’s not forget that most of this wealth was effectively stolen. And let’s also not forget that the end destination of this wealth is — nearly always — the rich countries and their tax havens. This is the core political problem. Tax, not aid, is the most sustainable way of financing development. Tax makes rulers accountable to citizens but aid makes rulers accountable to donors. The offshore system creates many profoundly damaging dynamics where a small elite in developing countries, and also developed countries, can conduct their financial affairs with impunity, riding roughshod over the population. This will always happen up until a point, but the offshore system accelerates the problem. Many of the governance problems we see in Africa are substantially, though never entirely, based upon the elites’ ability to do this. One fascinating aspect of the fight against the offshore system is that it brings the citizens of developing countries and the citizens of rich countries together into a common cause. It is unlike foreign aid, where rich countries dole out to poor countries, to put it crudely. However, on the question of tax avoidance there is an alignment and the possibilities for a global movement to emerge. I think we are seeing the stirrings of this now. The other thing I would mention is that when a Conservative UK prime minister supports the goals of the Tax Justice Network it highlights that this is not an issue of Left or Right politics. Certainly, the Left has more widely embraced the fight against tax havens but essentially this is about the corruption of markets and plenty of people on the Right also hate corruption. This could be a centrepiece of a new form of politics that transcends old political categories. I don’t think the Labour Party has seriously grasped this possibility and would say that the Conservative Party has probably gone a little further in this respect. There is, however, still a very long way to go. JGF: In a recent response to tax avoidance claims, Google boss Eric Schmidt announced he was “very proud” of their tax strategy — saying, “It’s called capitalism”. Is the work of the Tax Justice Network to advocate for something like responsible capitalism or is he just right: it is capitalism? NS: By saying that, Schmidt made one of the most damning indictments of capitalism that could be made. This is indeed what capitalism has become, but not what capitalism should be. For Schmidt to say “this is capitalism” is correct, but for him to be proud of it is absolutely outrageous. Is he proud of the corruption of markets? Is he proud of the fact that small companies are forced out of business by big companies not for the reasons of efficiency or productivity but because they are more able to use the offshore system to transfer tax dollars away from taxpayers? These tax avoidance strategies are unproductive, profoundly inefficient, and increase concentration in the marketplace — thus increasing prices for consumers. There is a litany of evils that comes out of the corporate tax avoidance system. “Don’t be evil,” they used to say at Google. Schmidt is now effectively saying that evil is to be celebrated. JGF: You describe tax havens as a form of colonialism by other means after territories have received their formal independence. The process in Gabon was described by a local Libreville journalist as: “The French went out through the front door, and came back in through a side window”. Could you explain what happened historically? NS: When France left its former colonies it set up a system that became known as Françafrique. This is a play on words meaning France-Africa and ‘France on the take’. France put pliable leaders in place such as Omar Bongo of Gabon who would always give preferential treatment to French corporations. It was a French hunting ground, the so-called chasse gardée, where French firms got huge commercial benefits and contracts. In a way, Gabon’s oil sector became a kind of offshore haven where political parties, the intelligence services, and others, could recycle and launder money away from prying eyes with the oil company Elf Gabon serving as a strange French offshore slush fund. It was a peculiar creation that has been partly removed but important parts still remain. The British system was far more subtle than the French and also much bigger. Essentially Britain did properly leave its former colonies but found a way of effectively controlling, or at least retaining a measure of control, over their national and international financial flows — achieving this through the tax haven system. In Treasure Islands I trace the origins of this system back to the 1950s when we saw the emergence of the Eurodollar market, and then the rapid growth of British-linked tax havens. Before this, when the British Empire was still alive and well, the financial sector of the City of London made gobs of money out of cosy imperial trading privileges. When the empire collapsed properly from the mid-1950s the City of London needed a new business model. They found it in a very simple formula: We will not regulate the hot money that comes into London, and we will turn a blind eye to questionable business. It started by coincidence in the 1950s but solidified into these huge Eurodollar markets that were essentially unregulated spaces. Around the system was a whole ring of territories — most importantly the Crown dependencies such as Jersey, Guernsey and the Isle of Man — and the 14 overseas territories, seven well-known tax havens that include The Cayman Islands, Bermuda and Gibraltar. So Britain had these offshore islands and it still partly controls them to this day: the Queen appoints the governor, who can strike down legislation. They are partly independent and have secrecy laws that allows Britain to wash its hands of any scandals. It is a very convenient mechanism and it’s also a feeder network for the City of London. Financial business from the Americas, say, gets drawn into the Caribbean havens: a mixture of clean, questionable and dirty money, and the fees flow up to the City of London (or Wall Street.) It is a system that a lot of the British public are hardly aware of and we need to do more research into how the City of London makes its money, of which secrecy plays an important role. JGF: Lastly, the success of many tax justice activists — such as UK Uncut — has been to discredit the arguments for austerity by showing the direct consequences of tax avoiding corporations: loss of or downgraded hospitals, loss of libraries and swimming pools and drastically reduced educational budgets. What other strategies can we use to challenge and confront the culture of tax avoidance? NS: If we’re talking about tax avoidance by corporations it will be a long haul since it’s a very complicated subject. But the fundamentals are very, very simple. What is needed is a system where companies’ taxes are based on the genuine economic substance of what they do and where they do it — rather than the artificial legal forms that their accountants cook-up: at the moment, accountants create structures that shovel profits into Luxemburg and The Cayman Islands in order to cut their tax bills. There are various ways to stop this kind of thing but one extremely interesting possibility is a unitary tax system. This looks at real factors such as sales, payroll and assets and works out how much happens in each territory. Then it looks at total global profits, and then portions out those global profits to the different jurisdiction according to these real factors, and they tax their share at whatever rate you like. If nothing real happens in the Bermuda branch, then none of the profits get parceled out to Bermuda and their zero percent tax rate is irrelevant. You cut tax havens out of the loop. Remove a huge slice of corporate activity from tax havens this way, and you remove most of their political cover, and they start to become easier to deal with on stuff like drug money and secrecy. There are solutions but it means constant political pressure and action on the streets: This is what has driven the changes more than anything else. The Tax Justice Network, backed by groups like UK Uncut, have found that the arguments put forward are pretty much unchallengeable. The intellectual argument is won, as far as I’m concerned. The task now is to keep beating politicians over the head with it, and change will come. Nicholas Shaxson is a British writer, journalist and investigator. He is author of Treasure Islands, and part-time writer and researcher for the Tax Justice Network, an expert-led group focused on tax and tax havens. Africa doesn’t have a debt problem — it has a private offshore wealth problem. This wealth could easily pay off the debt service payments if it was captured by African governments.